Map It! Okinawa: "Travel Prep to Kudaka Island"
"Travel Prep to Kudaka Island"
Step One: Check the weather report the day before, and on the morning of before you leave the house. Decide first if you think the weather will be suitable enough to do some sight seeing. Use your best judgment. Step Two: Look at the boat schedule. You have to determine when you want to leave the Azama Port and back plan your driving time from there. Plan on arriving at Azama Port 45 minutes before your boat departs. Visit their website for current schedule http://kudakakaiun.web.fc2.com/schedule.html . (Note: the last departure time at the end of the day will vary from winter to summer.) The website is in Japanese but the right hand column is the schedule leaving from Kudaka Island. The left hand column is leaving from Azama Port. You want to follow the left hand column for departing Azama Port. 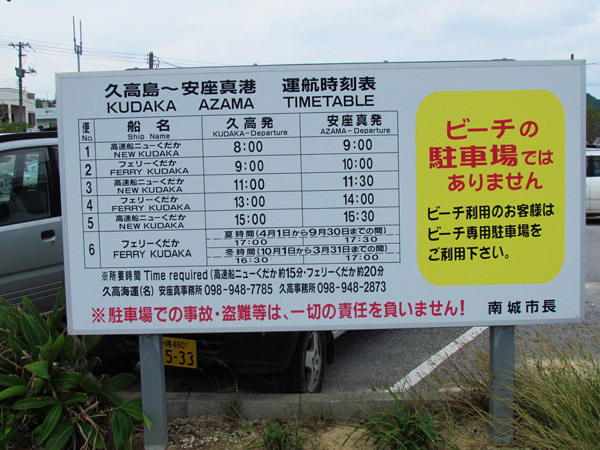 You will also see a large sign of the boat schedule inside the parking lot of Azama Port. Part of it will be in English. Step Three: Decide what to bring. If you have a friend that is fluent in reading and speaking Japanese then ask him or her to come along with you. This may be their first time as well, and may be a great experience for them. If you have an older Okinawan friend (age 40 or above) then chances are he or she will have a better understanding of the Okinawan dialect (Hogen) and more advance knowledge of reading Kanji. This can make a big difference, especially if you run into some of the village elders on the island or when it comes to reading some of the signs in Japanese. Bring a camera. Pictures are allowed (except at Fubo Utaki). Highly recommend you bring your own lunch and snacks. They do have a least one restaurant there but their hours vary and may not be open by the time you get there. There were no snacks for sale at the gift store on Kudaka Island. They do have soda machines there but best to bring enough water for the trip. Bring plenty of Yen. At a minimum, have at least have 6500 Yen per person. Recommend bringing a backpack, sweat towel, hat, and maybe an umbrella for shade or rain, and a light rain jacket in case it does rain. Note: They do offer bicycle rentals. Prices may vary from rental place to rental place. At one rental shop it was 300 yen per hour to 1000 yen for the entire day. Consider renting a bike. Kudaka Island is about 4 Kilometers from tip to tip making it a round trip of 8+ Kilometers. Vehicles are not permitted unless you have special permission or a local resident. Vehicle pass is highly expensive. Step Four. Driving to Azama Port. The most difficulty traveling to Azama port will be those who are coming from the north. If you live really far north, then to save time it is best you take the Okinawa Expressway going south exiting Exit 3, then make your way to Highway 329 on whatever route that is convenient for you. Once you get on the 329 heading south, you are gonna turn left at the 331 'T' intersection. Depending on where you get on the 329, this could be about a 30-45 minute drive still you see the 331 'T' Intersection. Stay on the 331 until you see the Azama Port sign. 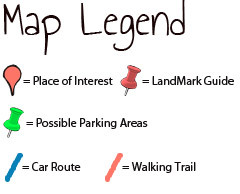 See landmark on the map. Turn left at the Azama Port sign. You will then veer right and you will soon see a small port (click on map icon to see what it looks like). Park in the designated lot. Parking is free. Note: Taking the Expressway is optional. For some, taking just 329 will suffice. Step Five: At Azama Port. There will be an office window where you will purchase your ticket. Chances are the staff will NOT speak English. That is okay. This is a chance to practice your Japanese, or you can just gesture the number of tickets you need. You can ask for a round trip ticket. See their website for prices. 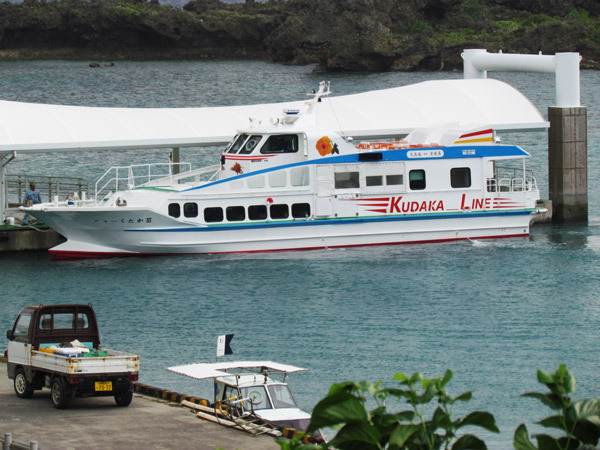 An adult round trip ticket will cost 1240 Yen to 1410 Yen depending on which boat you take. If you get a round trip ticket, she will give you two ticket stubs: one to go to Kudaka, and the other to come back to Azama port. She will give you a black and white map that is in Japanese with the boat schedule on the back. You can also purchase somewhat of a better map at the Azama Port store for 50 Yen. 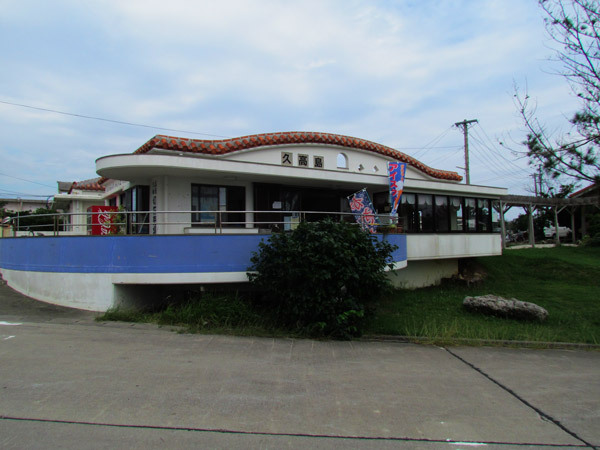 There are bathroom facilities, soda machines, and a snack shop at Azama Port. Note: You might want to buy just a one way ticket and then decide once you get to Kudaka what time you would like to come back. Step Six. Boarding the ship. There are two kinds of boats. Look at the photo album to see what each boat looks like. There is the Kudaka Ferry (larger of the two) and the Kudaka Express (little smaller and faster). The Kudaka Express will cost more. The time difference is negligible. The Kudaka Ferry takes about 25-30 minutes. The Kudaka Express takes about 20-25 minutes. However, both ships alternate in departure times. So if you want take the Ferry and come back on the Express, you have that option. If the ship personnel are ready, you can then make your way to the boat. Hand your ticket stub(s) to the ship attendant. That is it. You will be able to figure out the rest once you are on ship. Arriving at Kudaka. Once you arrive at the harbor in Kudaka, you will see an Office/Store along the walkway. You can't really miss it. At the gift store, they sell books (in Japanese) about the Kudaka ceremonies. There is a good chance that the staff working at the gift store may speak English. If she doesn't, then no worries. You will survive. You can't really get lost on this island. Just remember to be back at the port about 30 minutes before departure. The last boat leaves Kudaka around 1630 or 1700 depending on the season. Hello and thank you for the informative article! 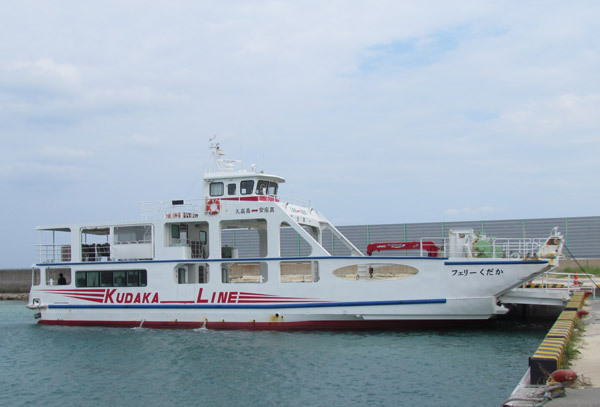 Do you know if visitors may bring their own bicycles on the ferry and onto Kodaka Island? Thanks again for taking the time to share your knowledge and experience. Website is the Property of Map It! Okinawa. Simple theme. Powered by Blogger.